I shared the beginning of our design process earlier this week. Now I’m sharing the details. My gut wanted all matte black for the space. 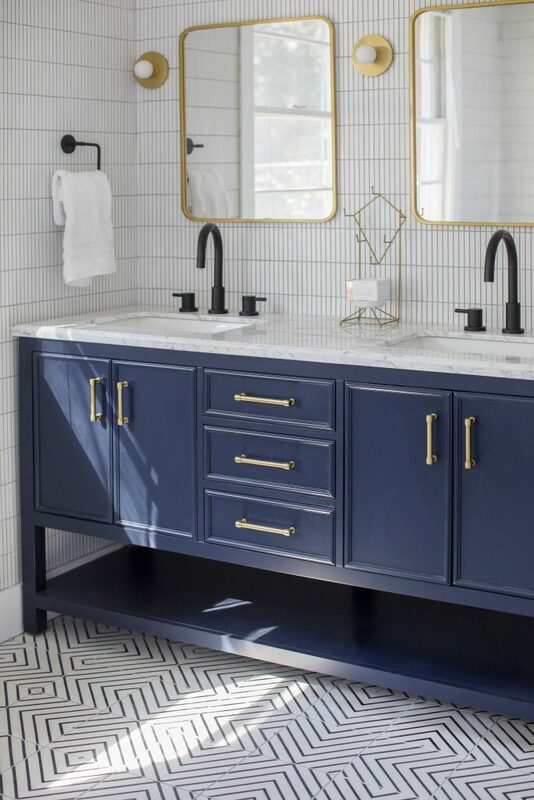 I had already selected and fallen in love with my indigo blue vanity with gold cabinet hardware and I thought mixing the two finishes (black and gold) would be more interesting and allow each to shine, as opposed to doing all one or the other. 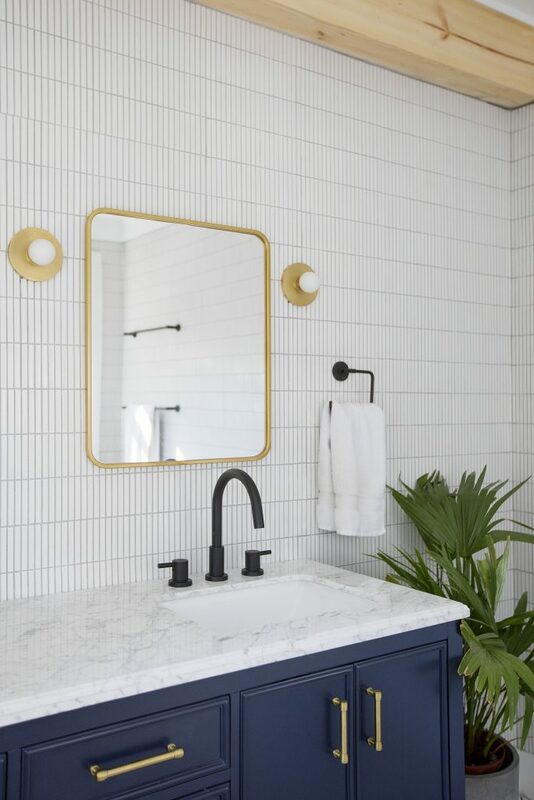 I think in a smaller bathroom or powder it makes sense to do all one finish, but when you’re talking two mirrors, two sinks, cabinet hardware, 4 towel racks, a shower and lighting, one of my good friends who works in interior design taught me that it could either become overwhelming or the opposite, get completely lost. So I did something unusual and mixed the finishes, which I ended up really loving. We chose the Signature Hardware Rotunda collection for the sinks and bath towel bars. 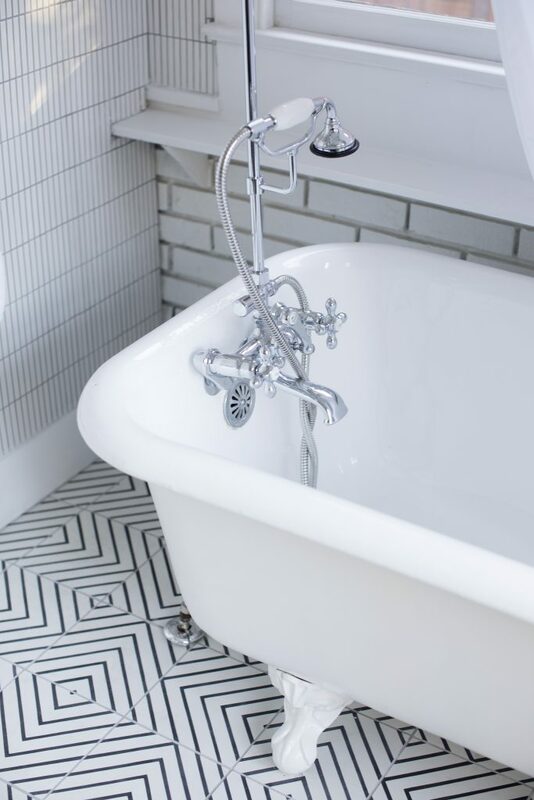 I thought the rounded edges would be clean and modern, and a nice contrast to the angular lines of the tile. 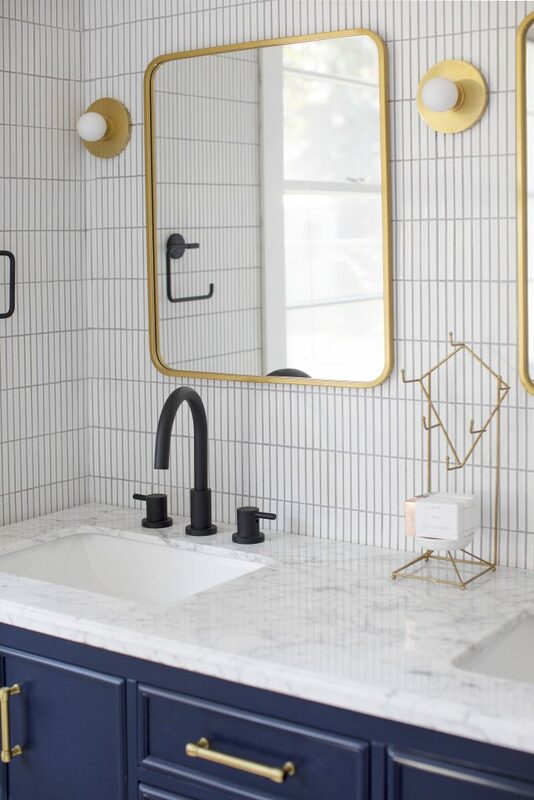 The hand towel bars were actually out of stock when I was ordering so I think we mixed in the Delta Trinsic collection for those, they went together pretty seamlessly. 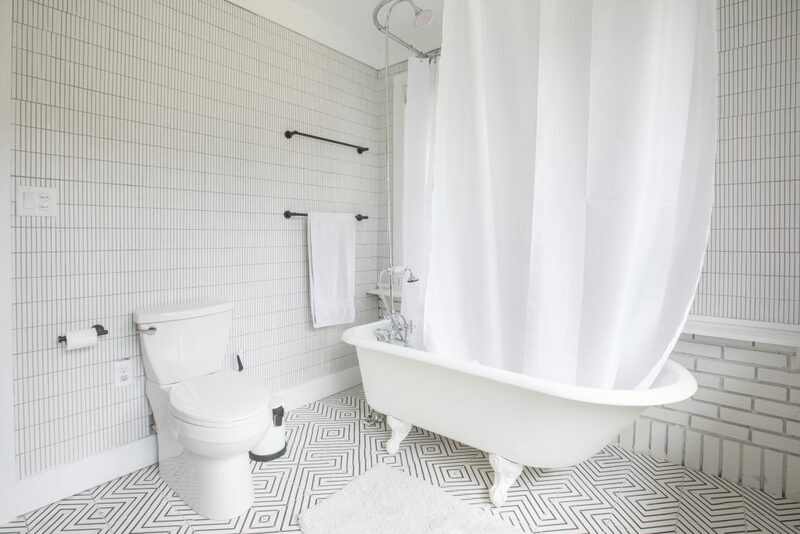 I also sourced the toilet from Ferguson Bath, Kitchen & Lighting Gallery through their Mirabelle line. I love the streamlined and modern look of the skirted Bradenton model. I discussed the shower kit in the previous post, but here I will mention that, yes, it does introduce another hardware tone in the mix. However, I was hard pressed to find a clawfoot conversion kit that wasn’t chrome or brushed nickel! 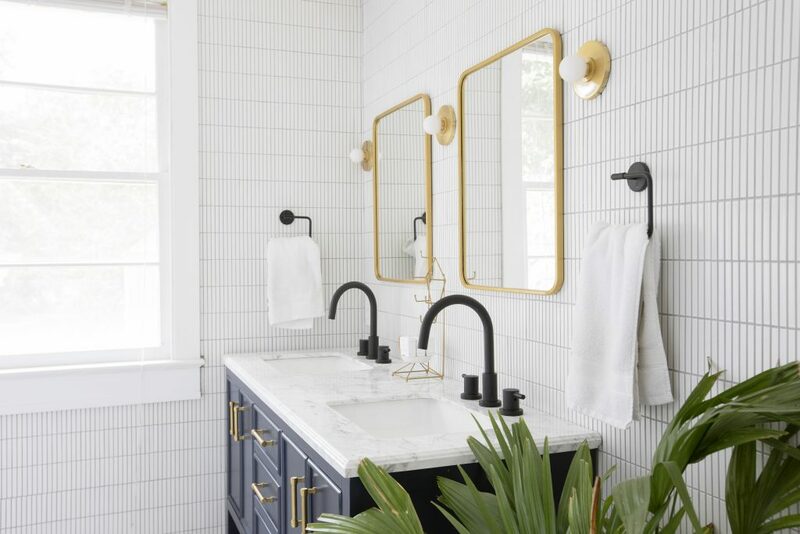 Signature Hardware does carry a few polished brass options, but in the end I decided the silver tone would almost disappear against the white bathroom and be less distracting than mixing the shiny brass with the brushed gold finishes I was using in the room, and I think it turned out just right. 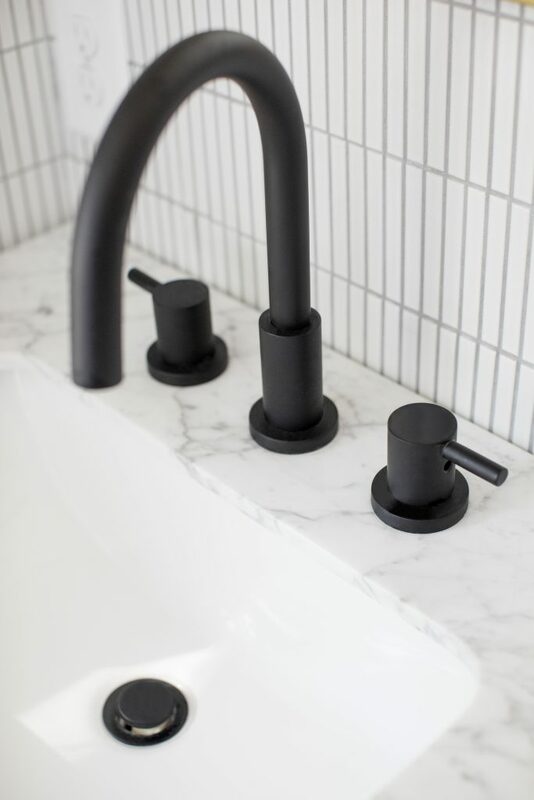 One of my absolute favorite features in the bathroom is the look of the matte black hardware against the white tiles and how clean and minimal it feels. It’s calming, which is exactly what I wanted to space to communicate.